BYU football coach Kalani Sitake is waiting on a contract extension, and a whole lot of people are waiting on — and wondering about — when or if he will get it. As a private school, BYU doesn’t have to announce such signings, nor the amounts or any of the details in or surrounding them. But Sitake has one season left after this next one on his five-year deal, and there’s been no word, not one peep, regarding an extension. He needs one soon, because everyone in college coaching knows if it goes much past where it is now for Sitake, the coach is a dead man walking. This is significant for a couple of reasons. First, national signing day is Feb. 6 and as a general rule recruits prefer to know who their head coach is going to be over the longer haul before they officially commit to a letter of intent. BYU already got commitments from the bulk of its recruiting class in the run-up to the early signing date in December, but there remain some desirable targets they would like to hit, adding to that class real soon, not just for the coming season, but for the foreseeable future. Second, the settling stability that comes to a program with guaranteed-monetary votes of confidence from administrators for the most important position in that program, its head coach, is significant, symbolically and pragmatically. If players and assistants know who’s in charge, firmly so, in the years ahead, they’re more likely to follow his command, to work their tails off for him, to take his direction and embrace his philosophies and push forward for a positive end. Otherwise, all kinds of dissent can creep in. And that can get messy. Sitake has learned lessons over his first three seasons at BYU. He started strong with that 9-4 season, utilizing talent put in place by his predecessor. He tried to be a players’ coach, so much so that he allowed too much slack in the reins, giving his players too much room to roam, and roam they did, considerably off line, leading at least in part to a forgettable 4-9 showing. That was one of the worst football seasons at BYU in 50 years. Such a nadir was forgettable, but maybe athletics director Tom Holmoe and his bosses have not forgotten it, double-clutching before extending Sitake’s deal. As mentioned, Sitake learned from it, making significant changes to his coaching staff, kissing off the laid-back decorum, dumping a good bit of the nice for a noticeably nastier approach, holding his players more accountable, and dialing in on the guys who were accepting his mix of guidance and demands, as opposed to spending major blocks of his time with the more project-oriented players on the program’s fringes. That resulted in a moderately successful bounce-back season in which the Cougars edged ahead of a couple of the P5 programs on their schedule, beating Arizona and nationally ranked Wisconsin, and mostly, not completely, avoided embarrassments against lesser programs to which BYU had no business losing. There were a couple of eye-catching lows, a 7-6 home loss to Northern Illinois, and a blowout loss to a great USU team among them. But the Cougars qualified for a bowl game and won it in rousing fashion, winding up with a record of 7-6 and feeding hope for success in the seasons ahead, success that won’t come easy on account of the opponents stacked up to start those seasons. In 2019, for instance, BYU faces Utah at home, Tennessee on the road, USC and Washington at home. There are other toughies, later, such as Boise State, Utah State and San Diego State. There’s more of the same in 2020. Is Sitake the best coach for that climb, schedules that would have severely challenged even the finest coaches BYU has had? There might be young guys in the wings who could take over at some time in the future, but now is not the time. 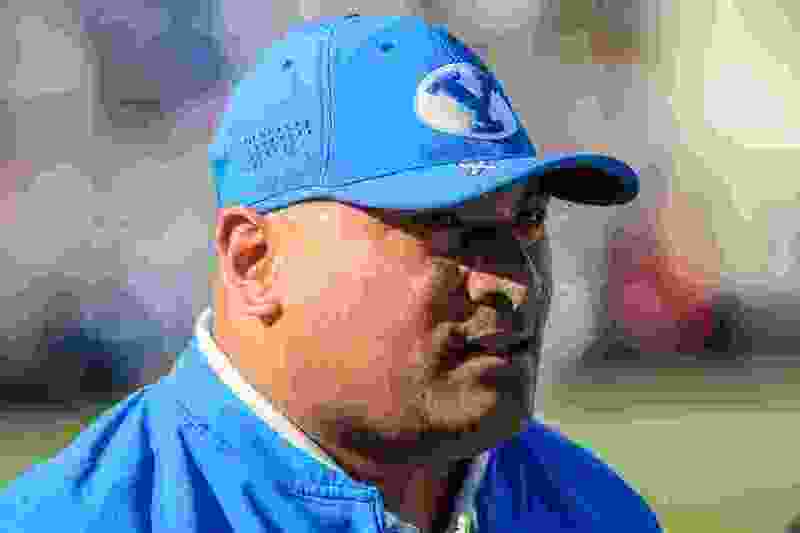 There’s no reason to waste the learning Sitake has already gained at this juncture, both as to making executive decisions on the field and to making them off it. Coaching at BYU is a difficult job — for the strategic competitive challenges that arise by way of independence and the ones lurking in the tall grass of a specific religion, a stringent honor code and unyielding academics. For all of those reasons, Sitake is still the man. He should be given a longer deal now, not later. Delaying his extension is less than constructive because of the unhelpful message it sends from the heart of the program outward. Even if wrangling among opinionated boosters with high standards and ambitious plans has settled down, and a thousand committee meetings have been conducted among the many power-brokers in the BYU hierarchy, all of whom think they have a say in such matters, and quiet discussions have been underway, making a strong public announcement is important. If Sitake is going to be extended, then make it known with a shout, not a whisper. If he’s not going to be extended after 2020, then … well, do what you’re now doing, and everybody will soon catch on. It’s never a good idea to let a valued coach go anywhere near the last year of his contract, drowning in doubt. Or to let everybody on the outside think he’s tiring as he treads the deep and gasps for air. Bad optics, bad symbolism, bad message, no matter the ultimate intentions. Make up your mind, BYU — now, not later — and scream it from the mountaintops to the valleys, and more importantly to the living rooms of talented high school kids who need to know. Correction: Jan. 25, 5:30 p.m. • An earlier version of this column misstated the terms of Sitake's contract.